"Smith's Cannon" or "The Duck in Battle"
Behold! Little Round Top as viewed from the Devil's Den! It is July 2, 1863 again. You are witness to a topographically, meteorologically and botanically correct Civil War battlefield reconstruction. Militarily speaking it is also very accurate. Civil War artists have been creating excellent battle art since the original conflict, but I believe my "landscape" approach is unique and a major improvement to the realm. The view presented to you here is also a leap from my usual format, as it is not painted as it appears today but rather as it appeared 133 years ago. My name is James Groves. I am a landscape painter. For the past 20 years I have made a career of creating large, what are traditionally termed "grand view" landscape paintings. A grand view landscape is a wider, more panoramic 'two-eyed' view of the chosen subject. It is very important to select the best vantage point and treatment of the subject to make it GRAND. By" treatment" I mean what is the best time of year, or the best time of day, or just what weather effects will elicit the best response to the viewer. Just about any scene, when given the right "treatment" (for instance, the use of a glorious sunset background), can become a 'grand view'. Two years ago, after visiting Gettysburg with the idea of painting a grand view of Little Round Top from the Devil's Den, an idea occurred to me. If I could get enough old battlefield photos, it just might be possible to recreate the actual battle in that area. Without question there could be no finer treatment for the view and, as the rocks everywhere were granite, it was probable that nothing major had changed in the battlefield topography - except for some roads and the vegetation. Eventually, using various books, I found plenty of photos (many taken a few days after the battle ended) and some even showed dead Confederates. Believing the back of the "duck" presented the grandest viewpoint , I began composing the "Battlescape". Although the old-time photographers chose many and various viewpoints for their views, I did find several photos luckily recorded on or near the "duck". Such photos were extremely helpful, but I found I was also able to transpose the others to good advantage. Additionally found and painted were exact renditions of moss and lichen upon the rocks and boulders as they appeared at the time of the battle. After getting the topography down to the best of my abilities, it became time to paint in the combatants, and for this the officer's reports and dead bodies provided plenty of insight. Of course the battle would have to have smoke, rifle fire and explosions. The cannon shells bursting were of great concern to me. Authors of books can present different sides and viewpoints, but the visual artist must commit to a single scheme and present it happening just one way. I wanted my shells to hit exactly where they had fallen 133 years ago. Looking at the old photos for telltale evidence of shell- hits became a tedious obsession. The James Smith shell (10 pounder) that hit the locust tree, split the rock and, possibly, severed a Confederate's foot was the most rewarding as the site could be easily found today on the battlefield. Another shell- hit (further left in the painting) could be found only in one old photograph as the road covers it today. The case shot burst in the upper far left was gleaned from Col. William Perry's (CSA)battle report. The absence of a battle line in the gorge: The advancing confederates [2nd. Georgia regiment] within the gorge or "slaughter pen area", are not shown in a battle line. The maze of boulders everywhere in and around the Plum run would not allow this usual field formation. I have shown the confederate line in complete breakdown to the right of Plum Run as Smith's cannon fire inflicted heavy destruction and casualties in that area. I believe that most of the dead confederates photographed several days after the battle in and near the "pond" area of Plum Run were victims of Smith's 10 pounder shells, as the 4th. Maine (Union), previously placed at the south end of the gorge, had retreated to the top of the gorge and were mostly involved with the Alabamians near the "duck" (where their monument is today). Lt. William Shepherd, 2nd Georgia, in his battle report, stated " The entire regiment moved forward in splendid order until it came to a deep gorge, where the nature of the ground was such that it was impossible to preserve an alignment, but, notwithstanding the rocks, undergrowth, and the deadly fire of the enemy, the officers and men of this regiment moved forward ...and did not halt until they were some distance in advance of their line...". It is plain from Shepherd`s account that his regiment met little resistance from Union infantry while moving rather speedily up through the gorge, and it may be, therefore, reasonable to assume the numerous bodies photographed days later were a product of Smith`s shellfire. The top of the gorge was as far as the confederates got. The 40th. N.Y. regiment and the 6th. New Jersey Volunteers came down the valley to engage the Georgians, but after exchanging some rifle volleys, they, along with the 4th. Maine infantry, withdrew from the gorge and den area. 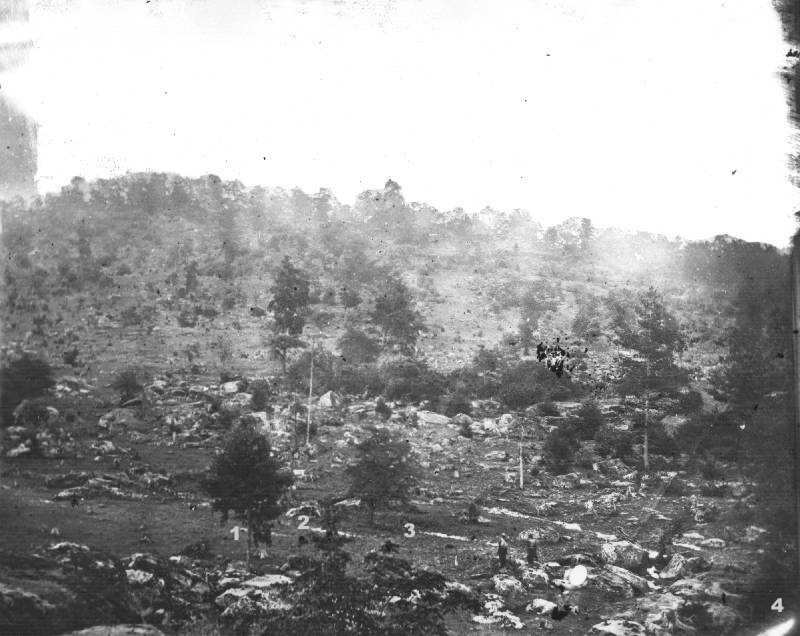 As the conquering Georgians were fearfully exposed to the Union fire from Little Round Top above them, a retreat to the relative safety of the woods and boulders was ordered at dusk. The Alabamians, along with other Texas and Georgian regiments, kept the Devil's Den area. The sharpshooters: In general, any excellent marksman was referred to as a "sharpshooter" (more often a role than a designation) and the most feared soldiers were those that shot true and straight. Growing up using a rifle was much more common in the countryside and so most "good shots" would come from rural areas. There were plenty of "sharpshooters" on both sides during the war but I tend to reason there would be more within the southern army. When a soldier lived to tell about a battle and he mentioned the boys on the other side were sharpshooters, it certainly struck more fear into the listener. The north was probably the first to take a group of sharpshooters and make a separate fighting unit (ie: Berdan's Sharpshooters). During the Gettysburg battle the Union sharpshooters wore green uniforms and some were firing the new Sharps Rifle Company's breach-loaders. I have included a dead Berdan's sharpshooter in my work as they were operating in the area at that time (a Confederate sharpshooter is reaching for the Sharps' breach-loader). I really do not believe that a Berdan's Sharpshooter would have been "caught dead" in this particular spot; Berdan`s outfit was placed well in front of the union lines that day and fought as skirmishers to the southwest of Big Round Top within the wood-line. As the southern lines gained ground, the sharpshooters drifted back through the woods toward Little Round Top, causing much havoc to their enemy. There are also some confederate sharpshooters in the view. They probably wore nothing special as the plainer the better. Eruption of the Little Round Top: The appearance of the smoke and fire coming from Little Round Top was conveyed to me by the writings of Col. William Perry, 44th Alabama Reg., who wrote that the hill "..resembled a volcano in eruption". As I could not generate enough smoke from [at that time] three 10 pounder parrotts, I added something burning on the summit. I regret I have no other descriptions to help with my visual account. With the absence of concrete visual info artistic license reigns. note: There are differing reports as to the number of cannon firing from Little Round Top at 5 p.m.; whether it was 3, 5, or, a full battery. Perry wrote that a "battery" upon the summit, but there is no time frame, nor do we know if he meant it was a full battery. After reading the officer's report of Gen. Henry Benning, CSA, commanding the upcoming Georgia regiments, I cautiously decided to show just three cannon in position. More on this later. 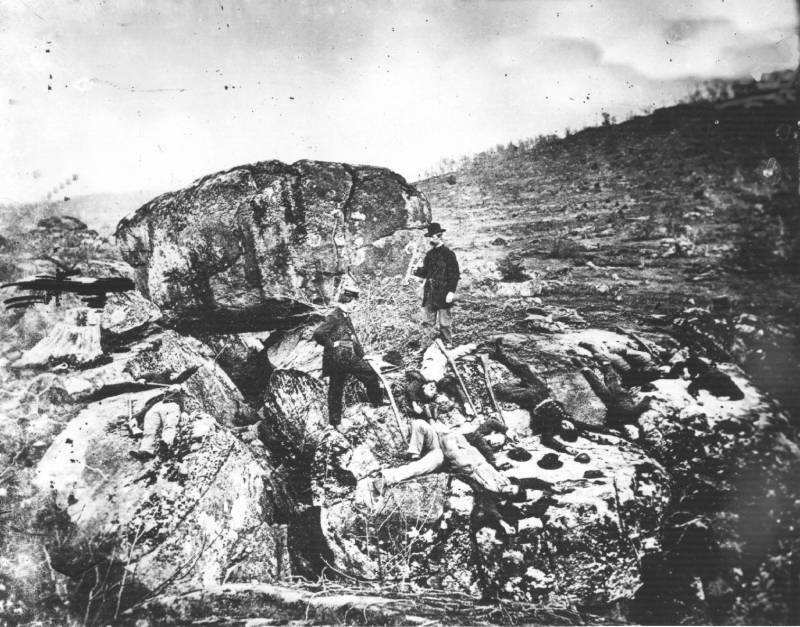 The case shot exploding above the confederates in the left sky area: Col. Perry wrote in his official report "..the enemy had put a battery in position on the terrace of the mountain to our right (Little Round Top), which opened upon us an enfilading fire of grape and spherical case shot.". This case shot was actually cylindrical parrott case shot but Perry may be forgiven as his side used the spherical kind (earlier CSA shelling left pieces lying about). Case shot is designed to explode in midair, showering the enemy with numerous deadly pellets. The granite : Upon seeing the painting, a fellow who sells headstones in Myersdale, Pa. informed me that an excellent grade of black granite occurred everywhere in the battlefield. As an igneous rock, granite is about as permanent as anything on the planet. I have always been amazed by rocks in general and I enjoy imitating their reality with paint. You may be assured that I recorded each and every stone noticeable in the battle area. Those moved or covered by the roads and parking lots were still visible in the old photos making their recreation possible again. The Sky: Thursday July 2nd, 1863, dawned gray, cloudy and humid and got hotter as the day progressed. It was reported that the clouds began to clear by mid-afternoon and so I show, by 5 p.m., a fairly blue sky with some ground shadows cast and the clouds breaking. The ominous darkening following the confederate advance is both theatrical and symbolic of conquered ground. Why the title "Smith's Cannon": History says little of Capt. James Smith who had the good foresight to split his 4th N.Y. battery of six cannon, sending 4 to the southern terminus of Houck's ridge (Devil's Den area) and leaving 2 cannon 400 feet behind in the "Valley of Death" to cover the Plum Run Gorge against assault. When the 2nd Georgians came up through the gorge, Smith's fire proved very effective stopping a probable "hook" around the embattled 4th Maine infantry. Earlier in the battle, it was a shell from Smith's cannon that informed Gouverneur Warran of the southern intent to take the Little Round Top. According to the story, the shell burst within the wooded Big Round Top caused a movement among the hidden confederates and sun light glinted off their armaments. It is rather likely Warran simply saw that the approaching confederate line far exceeded in breadth the union defense left which ended at the southern tip of Houck's ridge. Throughout the battle, the 4 forward Parrotts slowed and tore gaps in the oncoming confederate lines. Crossing the fields and wooded areas between the Emmitsburg road and Houck's ridge, these lines of 'butternut brown' must have seemed relentless! One cannon became disabled and was pulled back. The 3 remaining parrott rifles were eventually overrun, but by that time, Smith had already retreated to his rear cannon and begun "...firing obliquely through the gully, doing good execution ...(against the 2nd Georgian regiment)". From start to finish, every soldier in the area must have heard Smith's cannon, most would see them, and many would feel their blast. Of the nine real combatants portrayed within the battlescape, 5 are either dead or dying, and three- Col. Perry , Col. Shepherd, and Col. Walker- are prominently placed (Perry's likeness comes from vol.10 of the Photographic History of the Civil War). The final real personage, Capt. Smith, remains hidden and enigmatic, yet his handiwork is evident. Who has heard of Capt. James Smith today? Yet, I am certain there is something marvelous to be uncovered here. An interesting story could be written (in addition to the one that Smith himself, wrote) about this man's actions throughout the day. Earlier, when the confederate lines were advancing toward Houck's Ridge, a witness remembered Smith's "...guns were worked to their utmost . The heroic Captain gave every order in a clear, distinct tone, that could be heard above the tumult. I heard him tell his gunners to give them 5 and 6 second fuse, and when the gunners told him the case shot and shrapnel were all gone, he said,`Give them shell, give them shot; Damn them, give them anything!' ". Smith's cannon inflicted great damage upon the approaching confederates. Eventually however, the southerners reached the base of the ridge and the Parrotts could not be depressed enough to maintain firing. The Captain then called for his infantry supports to save his guns. According to Smith's report, when a third of the 4th. Maine infantry regiment ( previously separated and placed in support of Smith`s position on Houck`s Ridge were led up and over the ridge to engage the oncoming Southerners, they (and the 124th N.Y.)rightfully charged out in front of Smith's 4th N.Y. cannon. At that point Smith`s Parrotts became useless. Smith, whose goal was to direct cannon fire at the enemy, was reluctant to leave his cannon, but, aware that the confederates would "drive" up the unguarded Plum Run gorge, duty called for his necessary departure. Believing that his forward cannon were momentarily safe, he made a beeline toward his rear gun emplacement. Within the valley he apparently crossed paths with a regiment of fellow (40th) New Yorkers and understandably yelled out " Don`t let them take my guns, boys! "- a typical but useless thing to say as his fellow statesman had their own worries at the time. Still, Smith would have felt better in saying it. Saving his Parrotts was paramount to nearly all else! Casualties and losses: 2 killed, 10 wounded, 1 man and 3 Parrott 10 pounders captured. To indicate the close proximity of Smith's forward cannon, I have included a mortally wounded cannoneer (young lad, blond hair with bible) . Earlier in the afternoon, confederate shell fire, trying to silence Smith's forward cannon, began exploding around the gorge and terminus of Houck's ridge. Just prior to this shelling, Meade's chief of artillery, Gen. Henry Hunt, rode out to Smith's forward position. He conferred briefly with the Captain, but left the scene as confederate shells began hitting the area. Hunt wrote later that in climbing down the "cliff " he found stampeding cattle in the valley between Devil's Den and Round Top. He wrote that some cattle had already been killed by the shell fire, noting that one had already been blown to pieces. Hunt also wrote that these horned cattle were trapped and could not escape. Between the cliffs, the wood line on Round Top and boulders in the gorge (and even Plum run itself) there is a definite pen-like compound. I know that Civil War authors have long since concluded that "slaughter pen" referred to the number of humans killed in the gorge. Still, I would assert that seeing dead bovine in this area would elicit the phrase "It looks like a gol-durned slaughter pen!" to every soldier walking through the area ( every farm boy knew what a slaughter pen was). I tend to believe most writers coined graphic biblical phrases for those areas of human carnage. In fact, the "valley of death" was quickly applied after the battle to the area between Little Round Top and Houck's ridge. I believe the phrase "slaughter pen" was applied during the battle (probably by the 4th Maine infantry), thus denoting something visually obvious to the militants - such as dead cows. Still, one thing is certain; it is cannon fire that causes chunks of man and beast to be scattered here and thereabouts and so Captain James Smith had a hand in the matter. 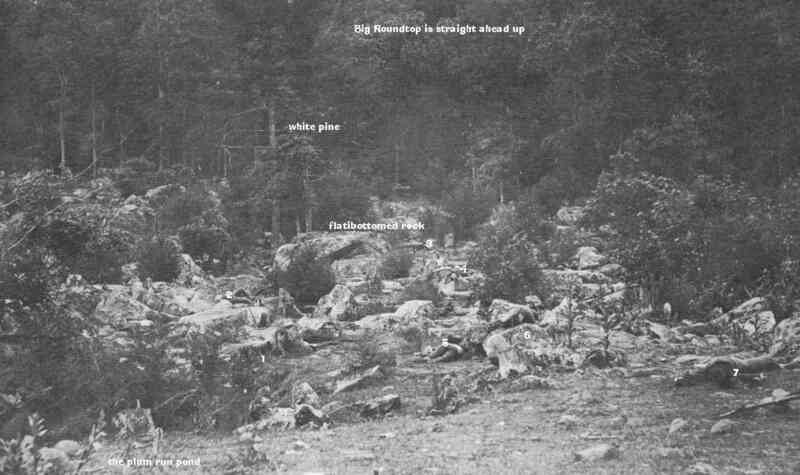 To illustrate Gen. Henry Hunt's writings I have included a dead cow lying in the gorge. View of the Slaughter pen :Visible bodies are numbered. Body # 6 may be a cow. Photo purchased by the artist from theLibrary Congress This photo proved invaluable in the construction of the trees and shrubs, rocks and ground painted into the left side of the 'Battlescape. Position and alignment of the confederate dead show they were moving up the gorge as opposed to across the gorge. The dead tend to fall in alignment with what killed them, and where they were heading---- Their feet or head facing their fate. The "Duck": Visitors to the battlefield today tend to think that history in this area began one summer day in 1863. The igneous rock "duck" antedates the battle by eons. It is not mentioned, to my knowledge, anywhere in modern or historical writings. Still it is a prominent feature of the battlefield. Since the civil war the "duck" was often seen as a backdrop for visiting war veterans. Currently it is the most popular spot to view the gorge and Little Round Top. Some guides refer to this out crop as "Table Rock". As an artist I am at a loss to understand how that handle ever became applied to this very un-table-like formation. The guides can probably tell you. This unusual rock combination of head and body is striking and captivating. It is historically possible that all manner of spiritual activities have occurred beside, upon, and within this natural or, just possibly, man-assembled formation. Centuries ago it`s cavities may have been filled with stone and covered with clay (for eyes and other details). A low roof may have covered it`s back cavity, creating a perfect temple. Even if not a product of man, the "duck" would have represented strong magic to early dwellers in the area. At the time of the battle part of the duck`s back was covered by Virginia Creeper. The original 1863 moss, lichen and creeper enveloping the duck are plainly visible in old photos made shortly after the fight. I was pleased to see them in their 'once upon a time ' appearance, and I carefully "replanted" each in its proper place. Photo: Library of Congress -November, 1863, showing fake battle casualties. Note the bush growing atop the rock in the mid-distance-----site of the 4th Maine monument today. The "duck" has a prominent place within my painted work just as it does on the battlefield. It stands today as a monument among many monuments, and I'm certain, a rock witness to more than just one conflict. Park visitors ignore it's facade in their quest to find battle markers nearby. Yet it is easy to see! It is a large gray duck, quietly floating on sacred ground at the side and entrance to the Plum Run gorge; a stone visage with a granite disregard for the passing of time. The particular locations of shell hits: While exploring the old photographs, I found evidence of what I believe are five 10 pdr. shell hits. 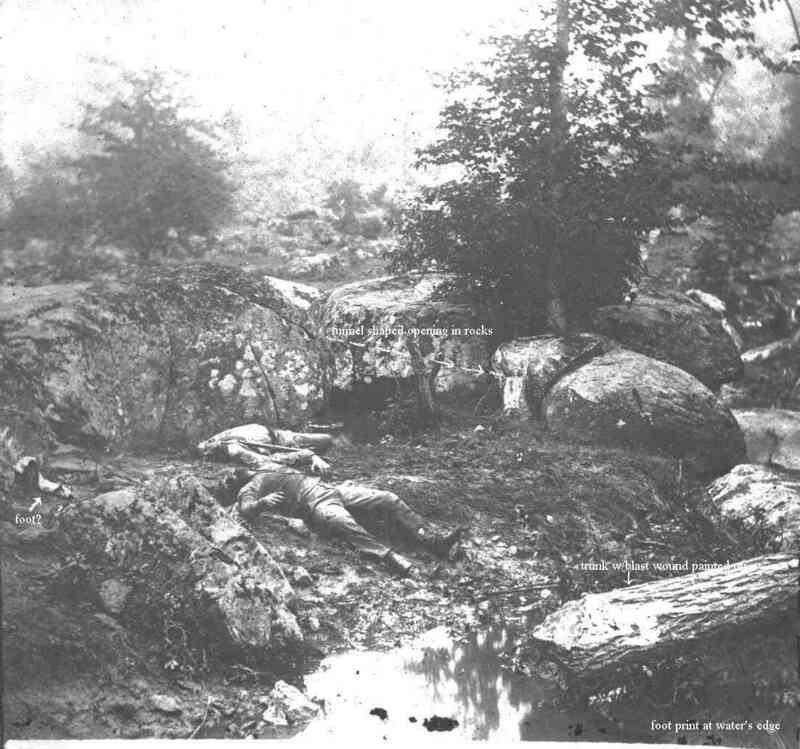 A photograph showing the top of the gorge ( slaughter pen area) taken soon after the battle shows three distinct slashes in the ground just west of Plum Run. These slashes, which appear to be filled with water (note the same reflective effect of Plum Run just above) are obviously not rocks, nor are they paths or part of the run. Each points directly back up the valley toward the location of Capt. Smith`s two remaining cannon( in the painting the cannon positions are shown as smoke above the "duck's" head). These slashes are certainly typical of low trajectory, spinning shell hits. Because of the current position of the park road and the time span since formation, any further study on the battlefield seems pointless. As I believe the marks are actual hits, I show how one(#3 in photo) is "formed" in the "Battlescape" painting. Note: The appearance of water filling these slashes gives credence to the idea of these photos being taken on Wednesday, the 10th of July, instead of Monday or Tuesday. There was a recorded downpour in Gettysburg on Wednesday (late morning). A rather horrific old Library of Congress photo taken several days after the battle shows the amazing power of a 3 inch (10 pounder) Parrott shell. Easily seen in the photo are two dead confederates and a (approx. )12 inch diameter Locust tree stump and its dislocated trunk. One confederate seems to be missing his right foot and what seems to be a foot is shown off to the left side. The shell, fired by one of Capt. 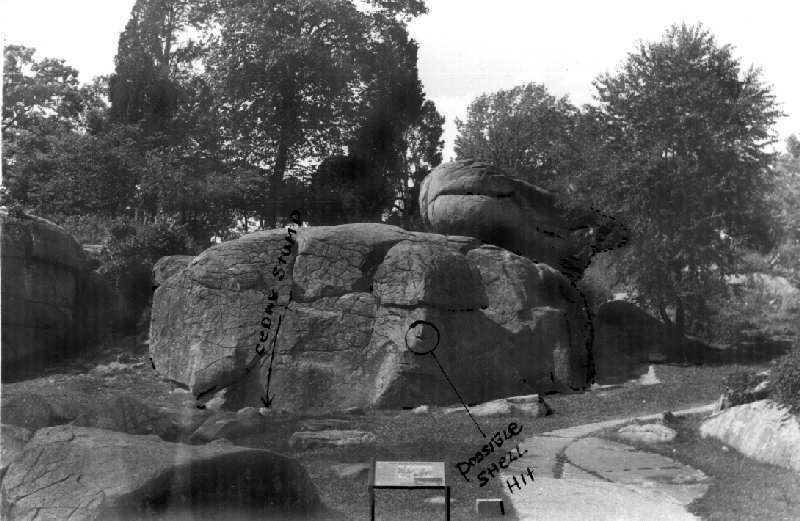 Smith`s two remaining cannon, has blown the Locust tree from it`s stump, severed the leg of the Georgian(debatable), and, striking an existent fracture line, split the large granite rock in two. The rock(s) has moved somewhat since the calamity; it`s smaller triangular piece rested for many years on the locust stump before later tilting further onto it`s side. The shell-hit is still easily seen today as a peculiar rounded pock-mark at the edge of the smaller split-off section. This gruesome old photo is as well composed as any scene I have ever witnessed, and it tells its story completely. When I first saw this photo I knew I had to include it's "happening" in the Battlescape. Visitors to the gorge today can easily study this area. Surprising to me was the silence of information concerning the action portrayed in this well-known photo. The battlefield guides do not stop at this location in their jaunts across the battlefield. There is no placard display set up at this site (just next to a parking lot in the gorge). I found this particular photo appearing in many different publications. Only the Library of Congress copies show the scene in its "original" condition. Curiously, most other versions show the Locust tree trunk's end to be nicely barked excepting a strange 45 degree angled flat area, either sawn or axed into the top end. A close look reveals the bottom end has a slight round concavity which would mate nicely to the bottom edge of the stump from whence it probably originated (there are no other logs or tree trunks showing in any photos surrounding this pond area- 12 inch or otherwise). This is a mystery to me. Still, I can apply my own artistic temperament to the task. I was always puzzled by the lucky position in which that tree trunk came to rest - that is, with it's wound upright to the camera. It seemed from the angle of the shell-blast that the wound would have ended up facing the ground. In order to get the wound to face the camera, Gardner would have to spin the entire tree about 180 degrees. I would guess this tree was too heavy and had too many branches to spin, and so Gardner, realizing the importance of the wound to the photo, may have begun sculpting the upward side with a saw or an ax in an attempt to duplicate the shell wound beneath. Or he may have been trying to cut off a root part which had come away with the trunk when it was bucked from the ground by the blast. (there does seem to be a hole in the ground at the fore and left base of the stump, and that surely would explain the 45 degree angle cut. ).Believe me, such thoughtful and crazy acts do occur to artists. I cannot explain the strangely sculpted fashion of the tree trunk in any other way (all other stumps in the old photos show that a cross-cut saw was used in a perpendicular fashion, giving them flat tops. Additionally, loggers cut their trees above the "flaring" of the trunk, generally leaving the trumpeting end behind and taking the straightest and most uniform part for cutting into lumber). I suspect Gardner was not happy with his sculpting job and later modified his photograph at his studio to give the trunk a very clever likeness to the stump- so that it would tell the whole story of the shell burst. Originally, I believed that the LOC photo was actual and all other versions were faked. Thanks to the discovery (by Tim Smith, Gettysburg Battlefield Guide and historian, and published by W. Frassanito in his 1997 "Gettysburg Companion") of a photo taken in November of 1863, and showing the curious 45 degree cut in the edge of the trunk, I know the LOC photo is the faked version. This November, 1863 photograph was pointed out to me by Mr. Kurt Graham of Georgia, who has my thanks. The photo was only recently discovered in late 1996-after the completion of the "Battlescape" and does not change the accuracy of the painting, wherein the tree is shown being blown from it's stump. 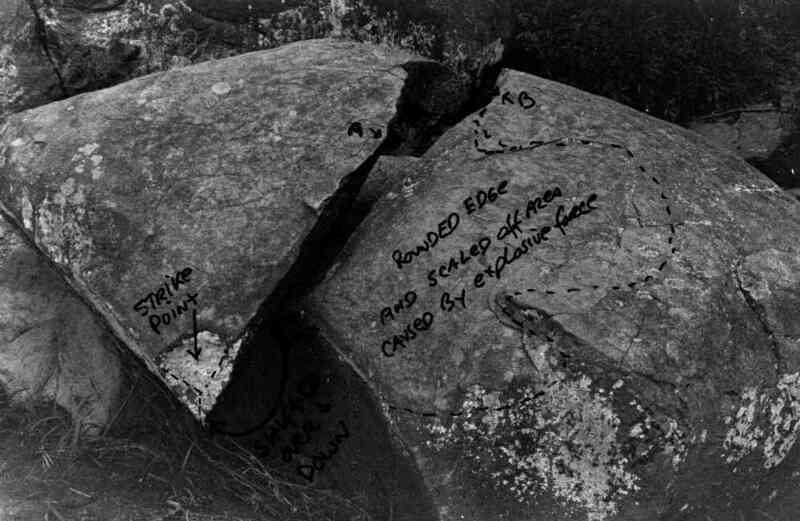 I am certain Smith's shell did strike the tree stump (the shattered stump remains the same in appearance in all photo versions and so we know Gardner did not fake that) and it did hit the rock and split it (very obvious to the eye when one visits the site on the battlefield). As I mentioned earlier, I believe the shell wound to the tree trunk is on its bottom side (suggested by the slight concavity). It should be added that Gardner must have observed the connection between the stump and the trunk as I don't believe the thought would have occurred to him otherwise- the trunk is twenty some feet from the stump. Being an artist, like Gardner, I have to wonder why he did not saw off a ten foot section of the trunk and spin it around so the wound would be face up. Lets face it, ten feet was all he needed for the photograph. Perhaps the property owner had not given permission or perhaps Gardner's assistants were not up to the task, or maybe they thought it would take too much time. Or maybe this course did not ever cross his mind. Then there is the final reason: Just maybe that shell wound was not there. Of course that notion begs the question 'Where is the actual matching diameter trunk blown from the stump?' There is no sign of any other tree matching the stump showing in any of area photos, taken then or later. A curious note: Was the 45 degree cut sawn, or axed? I believe it was sawn- and by a right-handed man. The appearance of the cut is very smooth and would have been accomplished more quickly with one of those old "one-man with added vertical post blade-end handle for a helper" type carpenter's saw. Such a saw could be used very effectively by one man. And I am certain Gardner's photo-wagon tool-chest would have contained such an instrument. As for my right-handed remark you will need a copy of Frasanitto's book (#4 in biblio. ), or his "Gettysburg, Then and Now", (Thomas Publications, Gettysburg). Once you find the photo, look at the water's edge just below the trunk's end. If you are looking at a full version of the Gardner photo, you should be able to pick out a rather distinct foot-print which I suspect was made by the fellow doing the cutting. As the footprint is on the viewer's side of the trunk, we may assume he is either right-handed or ambidextrous. Of course, an ax would cause a much bumpier hack job and there would be chips flying everywhere. I have not been able to find any of these chips lying about the photo. I have also been told by some whom I have shown the severed foot (complete with shoe , the sole peeled nearly off) that it is difficult to spot ,and so I here include a brief drawing to help. Although I am fairly certain this really is a human foot visible, I should add there exists good evidence that Gardner found and placed this foot in his scene as a prop ( a Library of Congress photograph by Gardner taken of the distant soldier does indeed show both feet still attached. However, both feet are in very unnatural positions, possibly indicating shell-blast mangling). The absence of a Union line on the western slope of Little Round Top: In the painting I show reinforcements (140 N.Y. Reg. of Stephen Weed's brigade) descending from the summit of LRT, stopping the confederate attempt to take the south side of the hill. According to Col. James Rice's report (44th N.Y. regiment, Strong Vincent's brigade) the 140th N.Y. was brought to the summit just in time to avert a southern capture. The 140th did not have the opportunity to load their rifles; With bayonets and momentum they pushed the stubborn Texans back. Following the 140th regiment, 3 cannon of Hazlett's battery went into action. Seeing that the southern advance was gaining Houck's ridge, Gen. Weed ordered his other regiments from the Wheatfield Rd., down the valley, to support Smith's 2 remaining cannon. Additionally, Gen. Robertson's (CSA) report mentioned Union reserves within the valley at the base of LRT as his regiments were fighting on Houck's ridge. After the failure of the 6th N.J. volunteers and the 40th N.Y. to retake the gorge and Houck's ridge, Weed's regiments were ordered to ascend the western side of LRT to defend Hazlett's guns. At that time Smith's cannon were withdrawn to the north. Gen. Benning (CSA), commanding Georgian regiments within a second confederate battle line, who later arrived upon Houck's ridge (and whose report contains several overestimations of union strengths), maintains that he saw a Union line extending all the way from Smith's cannon up the side of LRT to Hazlett's battery (then firing 5 cannon). That's a lot of soldiers! Unlike his 2nd Georgia regiment, which met little early resistance as it skirted the right of Houck's Ridge, Gen. Benning's middle and left line made meager headway against the union defenders of Ward's brigade. In light of his report, I believe that Benning saw LRT only after all of the defending union regiments pulled back from Houck's Ridge(Generals tend to hang back). Only then can I fathom the long line of blue stretching from valley to summit. Thus, in the time frame of my work, I depict all of the Union troops to be within the valley and none on the western slope of LRT. What's wrong in Benning's report? For one thing, he recorded too many union cannon. He initially observed 3 cannon (Smith's) on a terrace of Houck's Ridge and 3 other cannon firing from the very top of that ridge. After visiting the battlefield, I finally decided that Benning may have observed (from a distance) the late afternoon optical illusion of the summit of LRT appearing to be part of Houck's Ridge- which was treeless in 1863. When this is considered, Benning's report begins to make some sense. At least 30 old photographs were used as resource material for the "Battlescape". As I do not have permission from all the various authors and publishers, I can not include many in this site. I encourage the viewers to do their own research, find as many of the numerous historical photos available, and see for themselves the accuracy shown. There is much information, insight and fun to be gleaned from such adventure. Of the numerous resources used in gathering historical "reality" for the battlescape, I recommend the following books. The reader must bear in mind, of course, that the authors may not necessarily agree with what is shown within my production. If any elements within the battlescape are found wanting in credulity, then let the criticism fall to me. 1. Miller,"The Photographic History of the Civil War" (N.Y. 1911)-10 volumes containing just about every known civil war photograph and readily available at major libraries. 2. Luvaas and Nelson, "US Army War College Guide to the Battle of Gettysburg" (1986) - A very informative collection of (abridged) officers reports. Much of my military info and visual troop placements were garnered from these reports: Capt. James Smith, Col. James Rice, Col. William Perry, Gen. Gerome Robertson, and Maj. John Bane. All reports should be read at least twenty times. 3. William Frassanito, "Gettysburg, A Journey in Time"(1975 Thomas)- The first definitive major photographic study of the battlefield. A battlefield "bible" that generates interest in the 3 day conflict using the "then and now" photo approach. A very handy tool for battlefield observation. 4. William Frassanito, "Early Photography at Gettysburg"(1995 Thomas)-A masterpiece of civil war era photographic study, and a treasure of information. The author's approach provides plenty of details uncovered since his 1975 book. Obtained in the later part of my actual painting production, this book was a godsend. The Gettysburg National Historical Park and it's Museum were visited often throughout my endeavor and provided much visual self-help (for reclusive individuals such as myself). Without such freely accessible public reserves and services this work would not have been possible. Acknowledgements : I garnered information from a good many people, before, during, and since this production. Please realize that your advice and criticism was\ is helpful (I am not much of a CW historian -my years as a civil war nut thankfully ended about the mid 70's. My talent is best used to visually analyze and recreate- I like to show a picture is really worth a thousand words). In particular, I would like to thank my wife, Carolyn, who stoically 'puts up' with me, and also my brother, Patrick, the historian of the family.